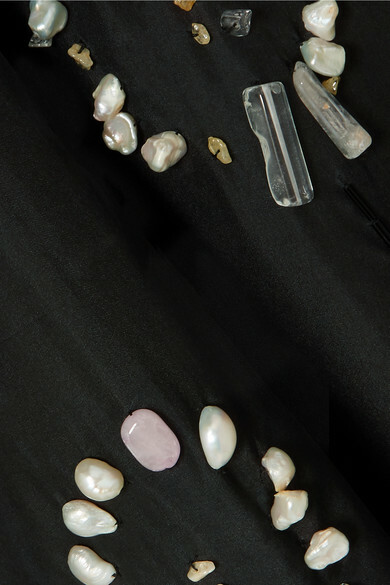 Grace Wales Bonner adorned her Spring '19 pieces with rose quartz to channel its healing properties - the stones, alongside crystals and pearls, form circles on this dress. Cut from black silk-chiffon a column silhouette, it's lined with ivory silk crepe de chine that just peeks out at the hem, and traced with glossy bugle beads. Style it with sandals and swept-back hair. Shown here with: Wales Bonner Pants, Dries Van Noten Clutch, Dries Van Noten Sandals.